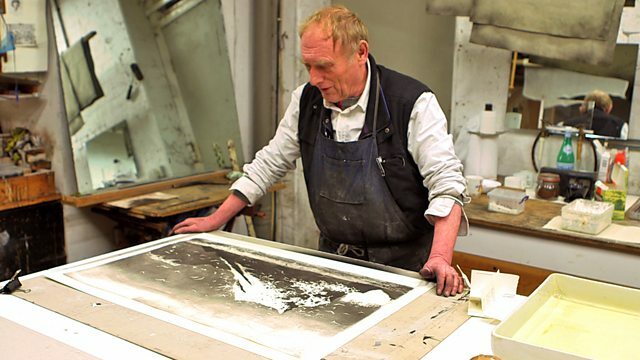 Documentary filmed in the London warehouse studio of Norman Ackroyd, one of the country's most celebrated landscape artists, as he creates his latest work. 'I don't have any grand plan, I just go where instinct takes me.' - Norman Ackroyd. Norman Ackroyd is one of the country's most celebrated landscape artists. Born in Leeds in 1938, he attended the Royal College of Art in the 1960s. After experimenting with pop art, he gradually turned to his first love, the landscape, and over the last thirty years he has documented some of the most remote corners of Britain. Norman tells the story of his artistic journey and gives a unique glimpse into his working life. Filmed in the converted London warehouse where he lives and works, we follow Norman as he embarks on the final stages of one of his monochrome prints. From delicate work on the copper plate, through preparation of the aquatint resin that brings shade and texture to the image and the application of the acid which etches the final picture from the copper, the film captures each stage of the process behind his craft. At the end of the day, without knowing how the piece will turn out, Norman passes it through the printing press, revealing for the first time his latest work, capturing the atmospheric craggy cliff of Muckle Flugga in the Shetland Islands.